Fine work as I worried all week-end although I shouldn’t have as I knew you could talk me through my installation issue. Went down fine and I will try the iron process we discussed before we deliver it. The beautiful gold embossed leather top was supplied to me by DCT Leathers in Canada. They did a wonderful job on this and the customer was delighted with the completed project. Thanks DCT for the first class product. Very pleased. 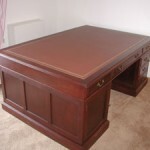 Here are before and after pictures of the mahogany desk you helped with. 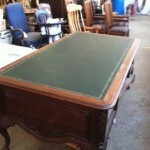 We delivered it Friday and the customer was very pleased. Thanks for all your help and you were exactly right, installing the leather was easy! I’m going to take these pictures and your sample brochure to our local leather upholsterer to let them know what we can do for them or their customers with leather top desks. When I originally got this job I called them to ask if they could care for the installation of the leather top and they said they didn’t do leather desk tops..it was too hard. So maybe I can change that by offering to do it for them. 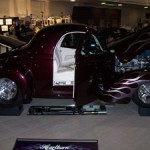 I’m sending these photos of two cars from the Performance World car show that was held last weekend.In the ’41 Willys I used two leather hides of Sateen Oyster and matched it up with Allante Oyster vinyl. The ’63 Corvette utilized only leather, three hides( so far) of Sateen Pillar Box. 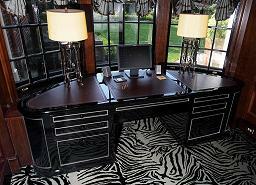 Wanted to share to pictures of the desk we just completed with the leather we received from you yesterday. This is the one I fouled up the first time. Thanks for your counseling. It’s so simple when following your directions. Feel free to use any of the attached pics you find useful. I will share some tips I have found useful recently; I am now using the border paste (as you suggest) and now using the container with the roller attached. I used to brush it on but the roller allows faster and more uniformed application. I am also using a small artist brush and touching up the edge with an aniline stain which makes a nice finished edge on both the wood and the leather if any light color shows on either. Both cars did very well at the show. Winner! Here are some photos of The Rusticator owned by John Allen at The Clayton Show. Your leather, my work. The Rusticator won here, then national, then international! 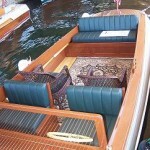 Wooden Boat Specialties was the shop that rebuilt her. Leather worked perfectly. 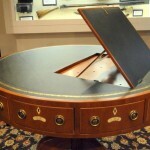 Thought you might enjoy seeing the kidney desk we just completed. The leather worked perfectly. 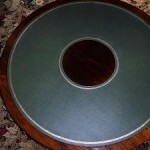 Not the color I would have selected with the wood but our customer was very pleased and the leather worked perfectly. Thanks for your good work! Another successful leather installed. 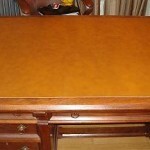 Just wanted to drop you a note, another successful desk leather installed – 10 years apart. The first time I bought leather for from you was in August 2001. Large butterscotch piece, 3′x4′ for a walnut partners desk. I use this desk EVERY DAY, and the leather is like new. There’s been no trouble at all with it coming up at the edges either. That was my first time installing desk leather, follow the instructions you gave, and it was simple and obviously has held up great, even with the large size. 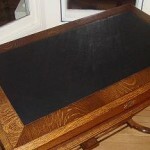 The new leather just done was a simple job on a small English writing desk that I just had refinished. The black leather really accentuates the the grain. Again, couldn’t be happier. Nice Work. Enclosed please find 2 pictures of the finished table. Thank you again for your nice work! On target! 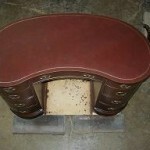 Attached are pictures of the desk that was designed and built by Fawn Meadow Wood Crafters Inc. with your leather. You were on target when you told me the leather would be the easiest part of the job. It was perfect and mounting it was easy. Thank you for your guidance. 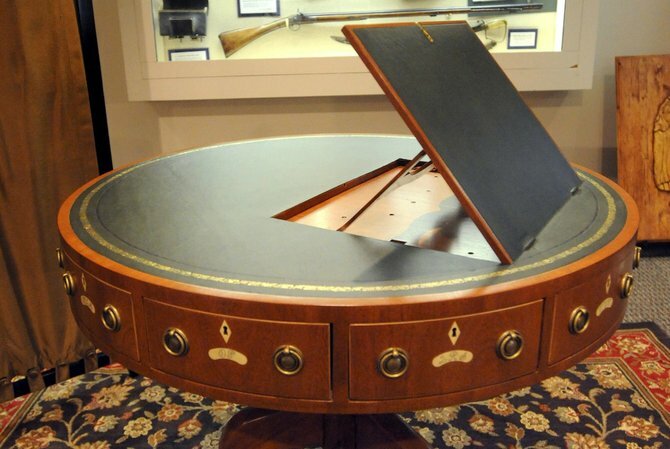 DCT Leathers recently supplied the leather for the replica table that President Madison signed the Treaty of Ghent to end the War of 1812. The treaty of Ghent was signed in Kentucky not at the White House in Washington due to the fact The British had burned the White house down and was being rebuilt. 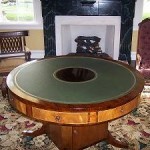 The following link will give more details about the table and a photo.